These special roller bearing types form the original brand essence of Eich and have been manufactured since the day of foundation. Initially, some of these bearing types had been used in various cases of application in mining. 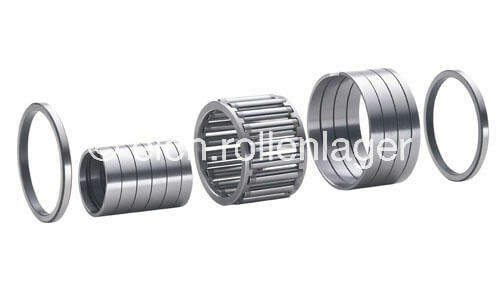 An example is the idler roller “Alaf”, a kind of wheel bearing for containers to convey coal. The experience with the use of bearings in mining, provided important insights concerning the performance of the bearings in other use cases. One example is the steel industry, split cylindrical roller bearings in the rolling mill, supporting- and idler rollers in continuous casters, split cylindrical roller bearings in the oven or in finishing equipment. The “Eich bearings” are all simply constructed, an inner ring, roller elements set (usually with a cage) and the outer ring. Depending on the requirements, any bearing can be made up from these basic elements. This applies whether the application involves split bearing housings, high operating temperatures or axial force transmission or not. Impact loads and small installation heights create no problem, even if several of these problems occur together. The bearings have a high fault tolerance for misalignments and tilting and are very resistant to attrition. Usually these are applications with a limited rotational speed (<< 100 min-1). So these types of bearings are more likely to be statically loaded, accordingly they are in most cases designed for high static load capacities or high rigidity. In addition to the constructional parameters, appropriate materials and manufacturing processes are used for these types of bearings. The standard material is a specially manufactured heat treatable steel with high requirements to the chemical composition and purity. For high-temperature applications, a special stainless steel is used. These bearing types are also made of corrosion-resistant materials or a version of a non-magnetic and specially heat-treated material. The production of roller bearings is subject to constantly refined production processes, which have been and will be developed over many decades. An important feature of these bearing types is the modular design. Generally, in a roller bearing, the stationary ring abrades the fastest. This can be easily replaced or even repaired, depending on the degree of attrition. Since the early 1970s, we offer our customers and partners the service to simply replace worn parts of our bearings. The individual parts of the particular bearing type can also be ordered separately.